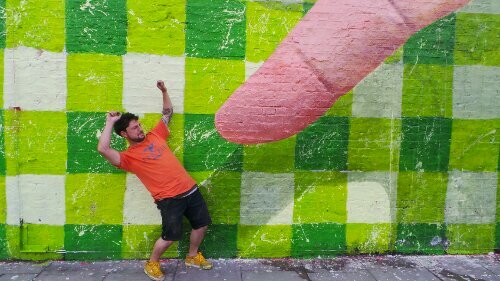 Six days into the painting of another huge mural, Argentinian artist Martin Ron has to finally take a break as the weather, great until this point, begins to have other ideas! Huddled in an alcove as the rain pours down, the latest mural on the iconic Village Underground wall in Shoreditch is almost complete! A green and white chequered background quickly catches the eye, a disembodied hand hovers over the top pointing a finger cocked in the shape of a gun towards the bottom left hand corner. On the far right hand side a scaffold has been set up where Martin is in the process of adding the final touches, a man who will eventually end up controlling the hand remotely via a giant mechanical arm and randomly, a badger! But for now rain has stopped play and the man famous for creating the largest mural ever to be seen in his home town of Buenos Aires has been forced to take cover. Martin Ron paints big and considering his recent record the famous Village Underground wall is small fry for an artist who recently painted a 1300 square foot giant mural on the side of a giant apartment block in the Villa Urquiza neighbourhood of Buenos Aires. That mural gained a lot of worldwide attention such was it’s impact and surrealist nature. Hard to summarise it incorporated a skateboard, a sculpture, a plane dragging a man by his hair and a parrot. Sound strange? Try describing a Picasso in one sentence and then you’ll understand that Martin Ron’s work is not designed to be easily summarised in a quick soundbite. 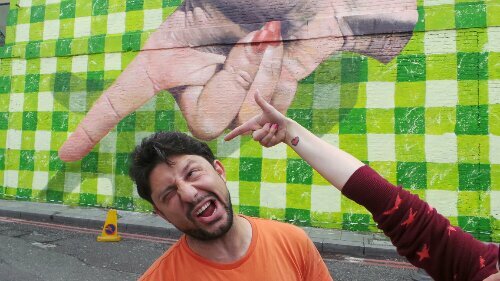 It’s Martin’s first time in London and so far he’s found an appreciative audience for his art “the project has been going on for a few days now and people like to come along to see the progress…the people here are very friendly and seem very receptive to street art” he says. The wall itself is part of a Street Art London project which has seen some of the world’s best street artists paint the huge space in the centre of Shoreditch. Martin Ron joins the likes of Stik, Thierry Noir, Pablo Delgado, RUN, Kid Acne and The Rolling People. It’s a roll of honour he’s proud to be part of “its a very important project, it is one of the most important walls in London” he says. Considering the weather we arrange to meet the next day when the heavens might have closed. 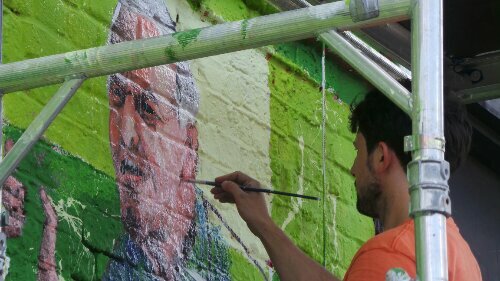 On Sunday he’ll also have some interpreting help from a friend at Buenos Aires Street Art with whom he’s worked on projects in the past, not least the huge mural in Villa Urquiva. English is not Martin’s first language so in order to truly express himself the interpretation will help. Despite this though he is more than capable of holding a conversation about his art, he’s had so much practice courtesy of the many interested passers by over the past few days. 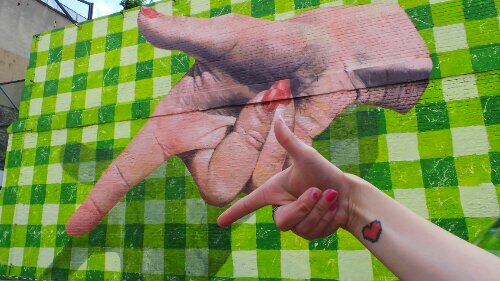 Street Art in Martin’s home town of Buenos Aires is thriving! As it would seem is the scene in many other parts of Latin America. “In Buenos Aires there are a lot of artists and a lot of big walls, there are a lot of people who love street art so it’s not concentrated in one place, there are a lot of projects” explains Martin. Local governments in the continent are also keen on the medium “I work with government to paint walls that are in a bad state or covered in propaganda or vandalism, they offer me walls on which to paint and give the materials and equipment I need to finish the project” he says. 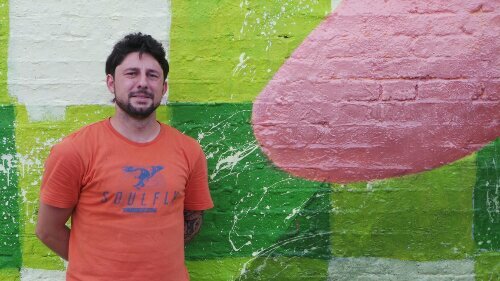 The attitude to street art in Latin America is different to that in Europe “people have more time to paint because it is not illegal” says Martin. “The quality is good because people are not in a hurry having to cover their identity and it’s not as complicated going about trying to find walls.” This may go some way to explaining the seeming explosion of South American art in London at the moment with the likes of Mateus Bailon, Alex Senna, Cranio and Mag Magrela all adding their mark onto the capitals walls. “In Latin America people like to travel and paint where they go so an artist from Argentina might go to Uruguay or Brazil to paint with friends and so a good network of artists is created”. Martin has a style which is all about impact. He uses photography to help compose his creations and uses pictures of real people who he has met or who have helped collaborate with the project and incorporates them into the art. He uses the technique of ‘hyper realism’ to make very detailed characters or details to form part of the mural. The end result is often similar to a photograph. He incorporates elements of fantasy and 3D and try’s to relate the subject matter to something relevant to the area. 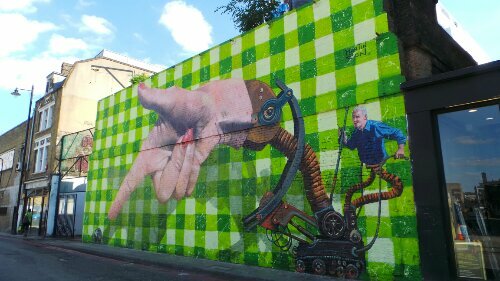 He incorporates surrealism and creates art which the local public would be able to interact with so there is a relationship between what is on the wall and the people who live or work nearby. 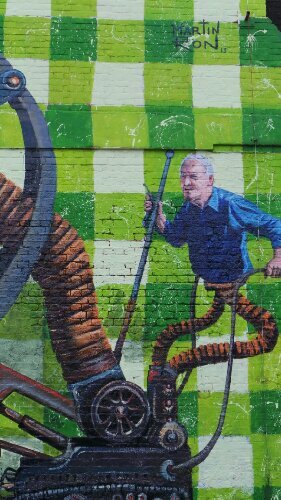 The hand in his mural on the Village Underground is that of his girlfriend and the man operating the machine which controls the hand, the father of a friend with whom he stayed during his first few nights in England. The inspiration for the piece comes from here too “I don’t pretend to paint about global political situations, little local daily situations are enough for me” says Martin. The little local situation in this case being the badger cull due to take place in some parts of the country within the next few days. A seemingly odd topic for a mural it was the first issue that Martin had really heard about since arriving in the country and after all as Martin explains “badgers are one of the most recognisable British animals”. The end result is named ‘BadgerGate’. 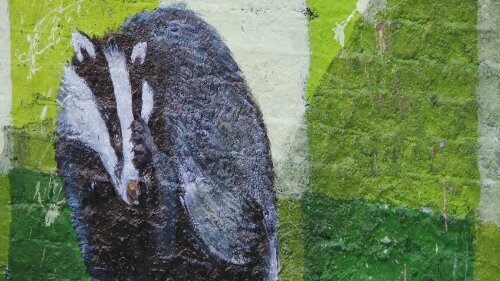 The mural represents the controversy in some parts of the country about the proposed Badger cull. The hand, now connected to a mechanical arm, is operated by a man angry that badgers have been tearing up his garden. A badger, scurrying around at the base of the mural is caught in the sights of the cocked finger from the hand. For Martin it’s all about being able to merge everyday challenges with everyday people “I don’t like trying to paint strong statements” says Martin. “I like to paint fantastic situations that co-exist with other situations around them on the street. I mix in the everyday occurances with surrealism and situations of fantasy”. The end result takes the viewer some time to take in, it’s not easily described in a soundbite and nor, I suspect, should it be. 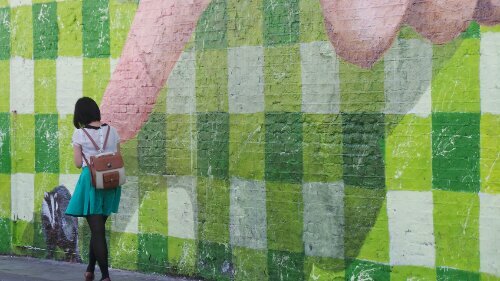 Martin Ron was interviewed over the weekend of 24th and 25th August at the Village Underground Wall on Holywell Lane in Shoreditch with interpreting help from Buenos Aires Street Art. 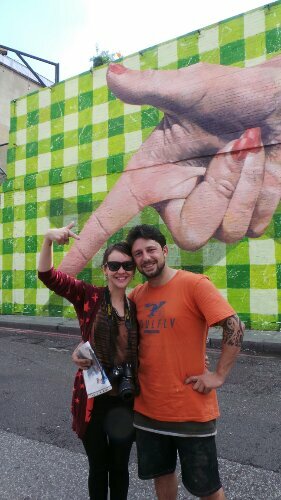 He was taking part in a project organised by Street Art London aimed at bringing the world’s best artists to London. A truly epic piece and a very interesting interview too! As usual a very informative interview, Thank you very much for the link to my blog entry Inspiring City! Another great post. Really interesting. Ian.